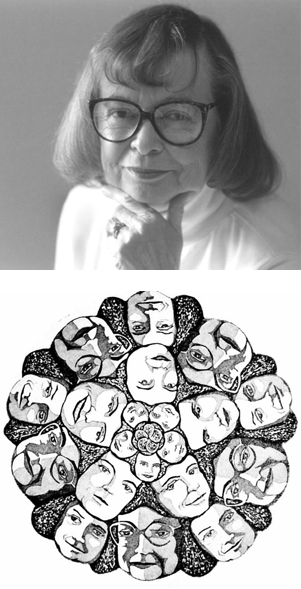 Elaine Bartholomew Rothwell was born in Minneapolis, Minnesota, on May 8, 1926. Elaine met the love of her life, William Stanley Rothwell, in 1945 just before he graduated from the U.S. Naval Academy and received his commission. They were married two days after Elaine's 20th birthday. Elaine and Bill would have four children and move from the Midwest to California in 1962. The Rothwells eventually settled in a new home in Los Altos where they lived for 35 years. In 2000 Elaine moved her graphic studio from Los Altos to Auburn. Elaine's father Fred was an artist and his daughter inherited his talent and passion for self-expression. Elaine earned a degree in art from San Jose State University in 1966 and spent the rest of her life creating a unique and stylish body of work. While she began with painting, it was in printmaking where she found her true calling. Her teacher and eventual lifelong friend Vibeke Woodbury gave her a start in etching and that became the medium she mastered. Rothwell was first known for her series of etchings using chess imagery and hidden chess positions. In her later series, Art History Mysteries, Mad Meg Amok, and Inklings, she borrowed familiar images from famous artists of the past and arranged them in new settings, forming the basis of an art history game. While many of Elaine's prints were playful and contained hidden images she also dealt with serious themes and a variety of subjects, reflecting her wide-ranging mind and powerful intellect. By means of visual puns, figure-ground ambiguities, and enigmatic images she would seek to baffle the viewers' eyes with visual games, presenting the cerebral pleasure of seeing two things simultaneously, or seeing familiar images in new ways. Rothwell's work has been shown in competitive juried national and international exhibits in 10 states. She was listed as an artist in Marquis Who's Who of American Women, Who's Who in America, and Who's Who in the World for several years. See "Who Was Who in America" 2011 edition for a more complete Biography. Her etchings (signed as E.B. Rothwell) are in the permanent collections of The Triton Museum of Art, Santa Clara, CA; The Newberry Library, Chicago, IL; West Valley Art Museum, Surprise, AZ; and Brand Art Center, Glendale, CA.